1. Rub pork liver with salt then grill brown. Let it cool. 2. Chop into serving pieces then place into bowl. 3. Add onion, chili, vinegar, salt and pepper. 4. Toss and serve together with cold beer. 1. In a pan, heat oil then saute garlic, onion and peppercorns. 2. Add oysters and vinegar then cook until almost dry and brownish. 3. Remove from the pan and set aside. 1. In a same pan, pour soy sauce and water then bring to boil. 2. Add green chili and simmer until liquid is reduced. 3. Put back the oysters then adjust seasoning according to taste. 4. Simmer for a minute then turn off the heat. Serve with steamed rice. 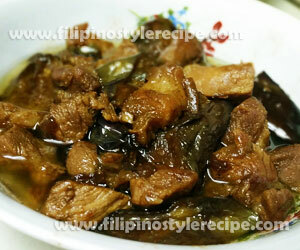 Filipino Style Recipe: Adobong talong at baboy or pork and eggplant adobo is another variety of Filipino adobo. The procedures is simple, we fried eggplant until brown and marinate pork then cooked and simmered soy sauce, vinegar, garlic, bay leaves, peppercorns, salt and sugar until tender. 1. In a bowl, combine pork, garlic, bay leaves, peppercorns, sugar and soy sauce. Marinate for 30 minutes. 2. In a pan, heat oil then fry eggplant until golden brown. Drain and set aside. 3. In a same pan, fry marinated pork until brown. Drain and set aside. 1. In a pot, Add pork, marinade, oyster sauce and water then simmer until tender. Add water if necessary. 2. 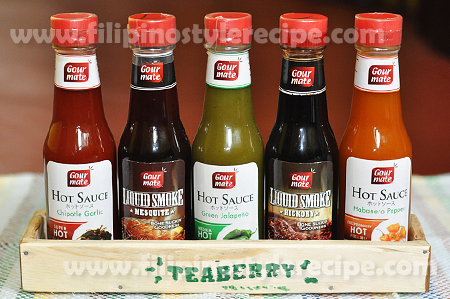 Pour vinegar and simmer for 5 minutes then adjust seasoning according to taste. 3. Add fried eggplant then stir cook for 2 minutes or until sauce is reduce. 4. Remove from heat then transfer to serving plate. Serve with steamed rice. Enjoy! 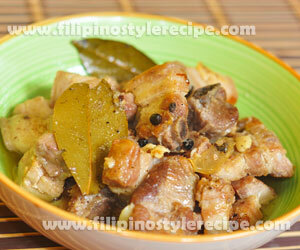 Filipino Style Recipe: Adobong puti or white adobo is another variety of Filipino adobo. 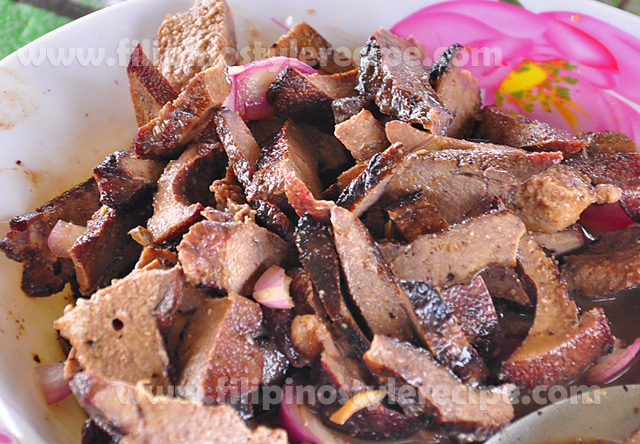 The traditional adobo is made of pork or chicken meat cooked in a blend of soy sauce and vinegar together with spices. 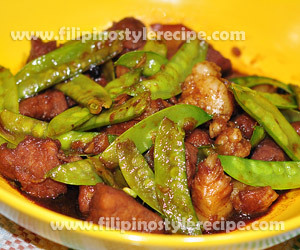 This version of adobo does not contain soy sauce instead we used salt or other seasoning to adjust the taste. Fry the meat until light brown then cook together with the sauce until tender. 1. In a pot, arrange pork then add garlic, bay leaves, peppercorns, salt, vinegar and water. 2. Cover and simmer over medium heat for 20 minutes or until pork is tender. Add more water if necessary. 3. Remove the pork from the sauce and set aside. 1. In a pan, heat oil then fry pork until light brown. 2. Put back the meat to the sauce then simmer until reduced in half. 3. Adjust seasoning according to taste then simmer for 2 minutes. 4. Remove from heat then transfer to serving bowl. Serve immediately with steamed rice. 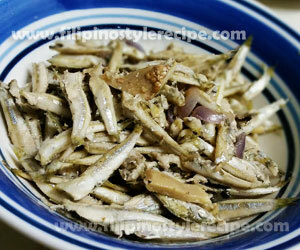 Filipino Style Recipe: Paksiw na dilis or anchovies is another quick and easy fish dish by Filipinos. 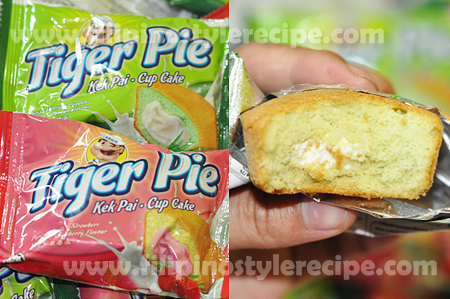 The procedure is similar to other paksiw. Normally the fish and vegetables cook in a blend of vinegar and some spices like garlic, onion and ginger then cover and simmer for 10 minutes or until done. Estimated time of preparation and cooking: 20-30 minutes. 1. In a pan, arrange dilis, garlic, onion, ginger, salt and black pepper. 2. Pour water, vinegar, cooking oil and green chili. 3. Cover and simmer in a medium heat for 10 minutes or until almost dry and done. 1. 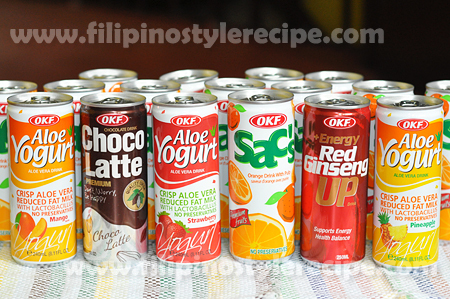 You may also add vegetables like eggplants, okra or bitter gourd(ampalaya). 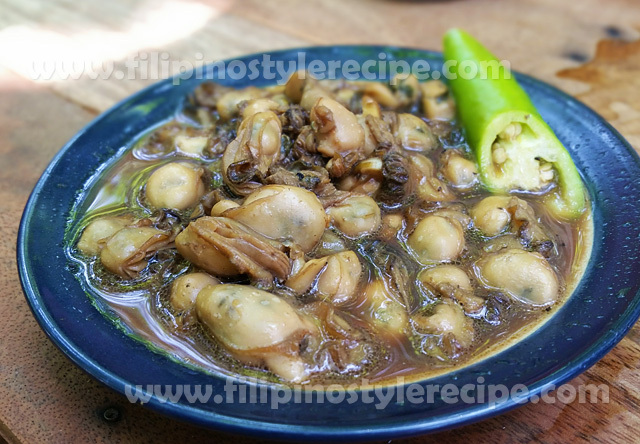 Filipino Style Recipe: Adobong talaba or oysters adobo is another variety of Filipino adobo consists of oysters cooked in adobo sauce made of soy sauce and vinegar. Oysters is an aphrodisiac food and a good source of energy for lactating mothers. 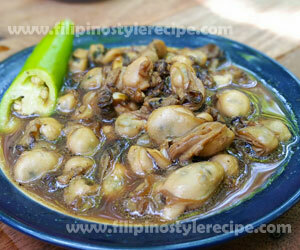 This kind of dish is so simple yet delicious and commonly served as appetizer or pulutan. 1. In a same pan, add soy sauce and water then bring to boil. 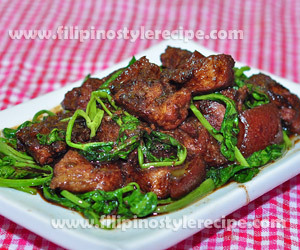 Filipino Style Recipe: Adobong tokwa’t baboy or pork and tofu adobo is another variety of Filipino adobo. 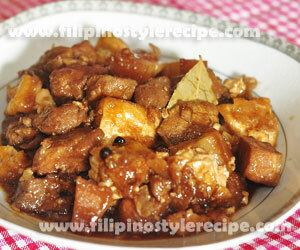 This dish is similar to usual tokwa’t baboy and pork adobo which we used firm tofu as meat extender . The procedures is simple, we fried tofu until brown and marinate pork then cooked and simmered soy sauce, vinegar, garlic, bay leaves, peppercorns, salt and sugar until tender. 2. In a pan, heat oil then fry tokwa until golden brown. Drain and set aside. 3. Add fried tokwa then stir cook for 2 minutes or until sauce is reduce. 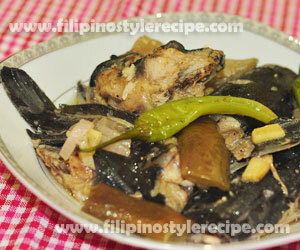 Filipino Style Recipe: Paksiw na hito is another quick and easy fish dish by Filipinos. This is another variety of paksiw which has a sour and salty taste. Usually the the fish and vegetables were cooked in vinegar, soda or water and some spices. I stewed catfish in soda to produce a sweet and sour taste to our dish. 2. Arrange sliced catfish then pour vinegar, soda, olive oil, fish sauce and ground pepper. 3. Add vegetables and green chili then cover and simmer in a medium heat for 8-10 minutes or until done.